THORNTON, WILLIE MAE [BIG MAMA] (1926–1984). Willie Mae "Big Mama" Thornton, blues singer and songwriter, was born on December 11, 1926, in Montgomery, Alabama. She was one of seven children. Her father was a minister, and her mother sang in the church. The church's early musical influence helped her win first place in an amateur singing show. Sammy Green of Atlanta saw her there, and she went to play with his "Hot Harlem Review." In 1948 she moved to Houston, where she lived for a few years. She sang and wrote songs for performances in the local clubs. Willie Mae "Big Mama" Thornton. Image available on the Internet and included in accordance with Title 17 U.S.C. Section 107. Big Mama Thornton's "Hound Dog" Record Cover. Image available on the Internet and included in accordance with Title 17 U.S.C. Section 107. Thornton only stayed a while, but she was influenced by Texas, and she contributed heavily to the Texas blues tradition. Willie Mae, Little Esther, and Mel Walker were a package show for Johnny Otis in the early 1950s. They became well-known and traveled to New York to play the Apollo in 1952. Willie Mae, as the opening act, sang the Dominos' hit "Have Mercy Baby," among others. She was a huge success and headlined the show the next night at the Apollo. The nickname "Big Mama" came from somebody after the first show, and it stuck. She was a large, tall woman, and the name suited her vocal tension and coarseness. 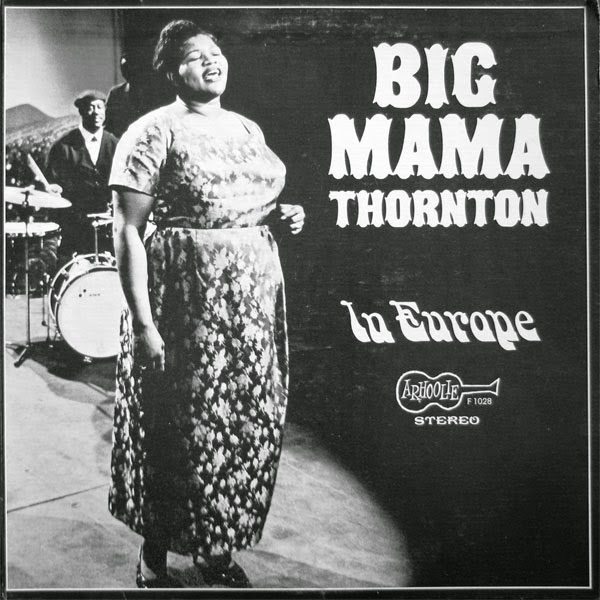 Big Mama Thornton in Europe Album Cover. Image available on the Internet and included in accordance with Title 17 U.S.C. Section 107. Willie Mae "Big Mama" Thornton's Grave. Image available on the Internet and included in accordance with Title 17 U.S.C. Section 107. In 1951 Don Robey signed Thornton to his Peacock Records label. Jerry Leiber and Mike Stoller wrote "Hound Dog," and Willie Mae recorded it. Big Mama flew from Houston in 1953 back to New York for Peacock–Duke Records's "Hound Dog" sessions. The B-side was "They Call Me Big Mama," and the single sold almost two million copies. She received a lifetime total of $500 for the song, even though Elvis Presley went on to make "Hound Dog" a rock-and-roll classic three years later. In a similar occurrence, Big Mama wrote and recorded "Ball and Chain," which became a hit for her. Janis Joplin later recorded the piece, and it became a huge success in the late 1960s. Thornton left Houston in the early 1960s and moved to the San Francisco Bay area. She toured with shows in America and Europe and played the Monterey Jazz Festival throughout the 1960s and 1970s. Her style captured the attention of many fans through the years because she was rough and beautiful and crazy yet controlled in her singing. Many companies recorded her work, such as Arhoolie Records, which released Big Mama Thornton in Europe (1966) and Big Mama Thornton with the Chicago Blues Band (1967). On the latter, Muddy Waters, Sam (Lightnin') Hopkins, and Otis Spann appeared. In 1968 Ball and Chain compiled separate blues songs by Willie Mae, Hopkins, and Larry Williams. In the early 1970s Big Mama recorded Saved for Pentagram Records and She's Back for Back Beat Label. Vanguard Records caught her twice in the latter half of the decade in two penitentiaries with Jail and again with Sassy Mama! She appeared again in New York in 1983 at the Newport Jazz Festival with Muddy Waters, B. B. King, and Eddie "Cleanhead" Vinson. The show was captured by Buddha Records on The Blues—A Real Summit Meeting. Big Mama Thornton died of a heart attack on July 25, 1984, in Los Angeles, California. That same year, she was inducted into the Blues Foundation Hall of Fame. Her sensitive, down-to-earth voice was heard in a posthumous album, Quit Snoopin' 'round My Door (Ace Records, United Kingdom), released on 1986. Virginia Grattan, American Women Songwriters (Westport, Connecticut: Greenwood Press, 1993). Sheldon Harris, Blues Who's Who: A Biographical Dictionary of Blues Singers (New Rochelle, New York: Arlington House, 1979). Gerard Herzhaft, Encyclopedia of the Blues (Fayetteville: University of Arkansas Press, 1979). Robert Santelli, Big Book of the Blues: A Biographical Encyclopedia (New York: Penguin Books, 1993). Handbook of Texas Online, Alan Lee Haworth, "THORNTON, WILLIE MAE [BIG MAMA]," accessed April 22, 2019, http://www.tshaonline.org/handbook/online/articles/fthpg.